I had the perfect plan, I was going to make a papaya milkshake to sip on while I sat down to write this post. The little produce market up the street I sometimes shop at didn’t have papaya, major bummer… But, I won’t let that stop me from writing. Let me tell you how good those grilled pizzas came out, the ones I made Saturday night. 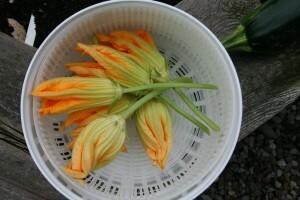 I collected a bunch of squash blossoms, since the squash patch is overflowing. I decided to stuff each blossom with a fresh basil and ricotta cheese mixture, well seasoned. Okay, I cheated on the dough to save a little time, Trader Joe’s works in a pinch. I crushed some fresh garlic into some really good EVOO, slathered the dough with it and then placed the plump, ricotta filled blossoms on top along with lots of marinated mozzarella slices. The other pizza was good too, though not as exciting, a slather of red sauce, thin slices of sopressata, lots of fresh basil leaves and a generous amount of marinated mozzarella slices. Onto the grill they went, and fantastic! The peach Prosecco sangria even came out well but I still prefer the traditional red sangria myself. To the Prosecco I added about a 1/3 cup of peach schnapps and four sliced peaches, I had yellow but next time would definitely choose white peaches. Let that chill in the fridge for several hours. You can add sugar but I didn’t think it needed it. BTW, I am not very good at following recipes nor do I write things down that I make, so hopefully this blog is going to help me with the second part at least. I look at cooking as experimentation, I see recipes as a starting point for me to build from and make it my own.